One of Wilhelmina McLane's wishes was that a scholarship be created to support a worthy graduate of her alma mater, Franklin High School, where Ms. McLane graduated in 1926. In keeping with this, each year the McLane Foundation awards a full scholarship not to exceed $20,000 annually, which is renewable for four years. 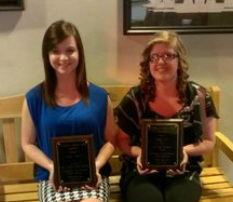 This is the third year that these scholarships were awarded. 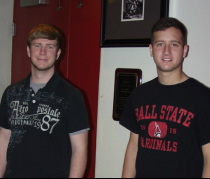 This year, after seeking the advice and consent of a small committee of FHS staff, Franklin High School senior Cory Seibert has been named the 2014 recipient of the McLane Scholarship and senior Brent Knipper has been named the 2014 recipient of the Wellinghoff Award. Cory Seibert, the son of Jack and Kathy Seibert of Franklin, will attend Miami University in Oxford to pursue a degree in percussion performance. He plans to earn an MS in percussion performance and play professionally. During high school, Cory has participated in vocal and instrumental music activities including Franklin Percussive Arts Society, Symphonic choir, Show Choir, band, and musicals. He's a member of the baseball team and active with Boy Scouts, where he's earned the rank of Eagle Scout. He is ranked in the Top 10% of the Class of 2014. Brent Knipper is the son of Bob and Libby Knipper of Franklin. Brent plans to attend Ball State University and major in musical theater. His ultimate plans are to move to New York City to perform and to teach musical theater at the college level. During high school, Brent has been active in a wide range of music and drama activities, the golf team, and the academic team. He's president of the Class of 2014 and was elected governor of Buckeye Boys State last summer. Applications will be available again through the Franklin High School guidance office in Spring of 2015.